22. That’s the number I want you to focus on today. It’s the number of Top 10 hits by Taylor Swift (Ironically, it’s also the title of one of those Top 10 hits). It’s the length of a cricket pitch if you’re measuring in yards. It’s the name of a 202-mile Interstate that runs from Birmingham, Alabama to northwestern Mississippi. Let me tell you something else you don’t know about the number 22. We know men and women are different, but I’ll add to that obvious statement with this: When it comes to word-of-mouth marketing, women depend on offline friend and family suggestions 22% more than men. Men rely more on web-based information like social media and ratings and review sites. This is just one of the many differences we found in our 2018 word-of-mouth report, Chatter Matters. In the report, we looked at the importance of word-of-mouth across variables, such as gender, age and online versus offline. 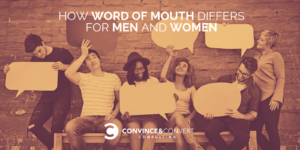 While word-of-mouth affects everyone, it doesn’t do so equally or evenly. The majority of word-of-mouth happens in face-to-face conversations. Some reports estimate as much as 90% of all word-of-mouth happens offline. And according to the Word of Mouth Marketing Association, an offline word-of-mouth impression drives at least five times more sales than a paid advertising impression. Here’s the thing: many of those offline conversations happen because they’re sparked by something online. Content is a propellant for word-of-mouth marketing. You can approach that propellant in several ways, but I want you to approach it differently. Especially, if you’re marketing to women. The simple act of standing out makes a difference. 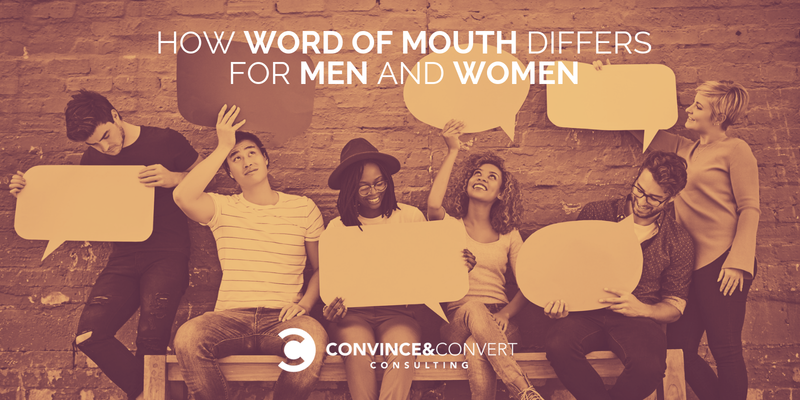 Here’s what I mean: In addition to having a great experience, or hearing about a great experience, women are more likely than others to engage in word-of-mouth when they are exposed to a product or service that is distinctly different. They are 49% more likely than men to discuss products or services they perceive as “different” from the norm. The goal isn’t to just be good but to stand out. In other words, same is lame. Consider the family-owned restaurant chain, Cheesecake Factory. Did you know they spend five times less on advertising than any other competing restaurant chain? If you’re asking yourself how that’s possible, I asked the same thing. Cheesecake Factory does something different, and their customers tell their friends and family about it. In fact, 83% of Cheesecake factory diners have mentioned this differentiator in just the past 60 days. Do you know what it is? No, it’s not their tantalizing case of cheesecake that makes us all salivate. It’s actually their giant menu. The Cheesecake Factory menu is 5,940 words long. They make chicken 85 different ways. That menu creates online and offline word-of-mouth. It’s human nature to ignore things that are average and to talk about things that are different. That’s why you have to create a talk trigger, a purposeful differentiator that compels people to tell their friends about you. You can learn more about talk triggers on October 3 when our new book is released. In the meantime, download the entire Chatter Matters report with the most recent word-of-mouth data for your very own strategy. Chatter Matters is a proprietary word-of-mouth report produced by Convince & Convert Consulting and the research firm, Audience Audit. It examines the word-of-mouth attitudes of 1,001 randomly selected Americans. The margin of error is approximately +/- 3.1%. Chatter Matters is a companion piece to my new book, Talk Triggers: The Complete Guide to Creating Customers with Word-of-Mouth. It will be released by Penguin Portfolio on October 3.